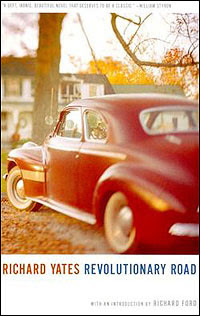 This may have been noted before in other places, but an introduction for a reissue of Richard Yates' 'Revolutionary Road' written by Richard Ford was titled "American Beauty" back in 2000. This introduction was also printed as an essay in the New York Times Book Review. It seems an astute title for the essay because it presaged the connection between director Sam Mendes and the novel -- "American Beauty" is of course the title of Mendes' Oscar-winning 1999 film and he went on to direct the film version of "Revolutionary Road." Ford saw some similarities in mood and theme - angst in the suburbs, an unfulfilled life, unexpected violence -- in the movie "American Beauty" and the Yates novel. So this little circle is oddly complete.